I went into winter in okay but not great shape. I am coming out of winter in fairly good shape. This was more coincidental than not. I started strength training in September, on a whim, and just kept at it. Doing this training has reduced some life long tension patterns, particularly in my shoulders and upper back. And being stronger has given me incentive to do more exercise related activities. Today is a good case in point. I had strength training this a.m. My right arm was a bit sore from having gotten a tetanus shot two days ago. Actually, both arms had been sore, but as of this morning just the right one was bugging me. And once I got going, it was just fine. I think that my pain alarm (located in my brain) didn’t go off, so I felt okay about doing all my exercises. And because I felt okay, I worked the muscles. It was a vigorous workout, complete with push ups and bench presses and bar pull ups and the like. By the end, I was tired. because I was late. The dog ran with me, most of the way. Once at Dorothy’s place, I put Ryder in the back of Dorothy’s truck and then we drove to the Butte. The Butte is a popular hiking spot. It’s a 1 mile, steep uphill climb. I’d done it in the past but forgotten how steep it was. The reason we went up there was because the WEMT students were to do a mock rescue scenario. Another student in my Woofer class was to be the patient and I was to be the bystander. Autumn, I later told the rescuers, had cartwheeled off the cliff, about 100 or so feet. 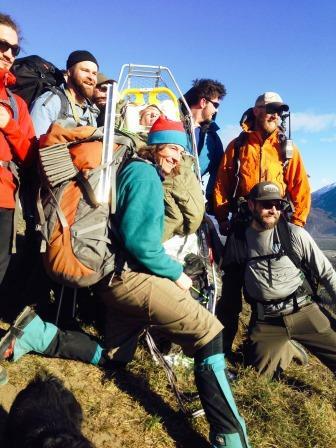 The WEMT students arrived, there were 13 of them, they tended to Autumn and packaged her up for the stretcher carry downhill. In the meantime, two students were with me and making sure I was okay. The students headed downhill with Autumn and thought their work day was over. It was not. Another student in our Woofer class was near the base of the hill – he was drunk and had a heart attack. John was a very convincing heart attack/drunk. And yes, the students were stymied by having to deal with him. And meanwhile, a hiker indicated to the WEMT students that she had asthma. This all made for a long late afternoon/early evening. We debriefed at the Butte Fire station. Autumn had been transported there by ambulance. Then we all parted company, with Ryder and me heading back to Dorothy’s place. I now had the uphill ride home ahead of me. My exercise-related day culminated with my taking Tinni for a walk. Amazingly, I am not at all sore, anywhere. This is the first time I’ve been able to say this in over a year.